Make either recurring or one time donations using a credit card, debit card, checking account or savings account. To commit to give to the ministries of Living Word and the proclamation of the Good News of Jesus Christ, please click on the link below. How can you help extend the work of Living Word for future generations? Consider a gift to our Living Legacy Endowment Fund. The mission of the fund is to provide funding for new and expanding ministries at Living Word, assistance in our local community, and church support of national and global mission. Contact Rick Carlson, Living Legacy Committee Chairman, if you would like more information on any component of Living Legacy at . Most people do not carry a checkbook, but you probably have a smartphone. 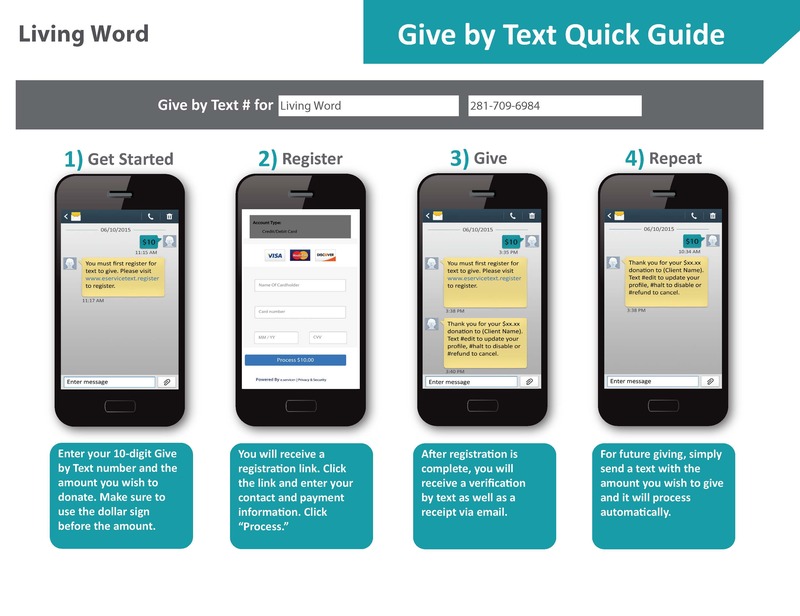 Now you can make a contribution as easily as sending a quick text message. If you would like to give by check or cash, offering envelopes are available. To request envelopes, please fill out our online form or contact Julia Wiseman in the church office at or 281-392-2300 x205. Amazon will donate .5% of the price of your eligible Amazon Smile purchases to Living Word whenever you shop on Amazon Smile. Your purchases at Kroger can benefit Living Word when you enroll in Kroger Community Rewards and a percentage of your purchase is returned to Living Word in cash. Thrivent members may chose to direct Choice Dollars to Living Word. Visit Thrivent.com for more information. Offerings and contributions to Living Word are tax deductible and are graciously received in direct support of our ministries. We pledge to be faithful stewards of your gifts. Our Church Council, guided by the Holy Spirit, exercises discretion over final allocations based on the congregation’s authorized budget.